Today, I’m excited to have Tim Soulo on the show. Tim is the Chief Marketing Officer at Ahrefs, an industry leading SEO tool powered by Big Data. He has 10 years of practical experience in SEO and digital marketing. He loves to share his knowledge of SEO and he speaks at industry conferences all over the world. Steve: You’re listening to the My Wife Quit Her Job Podcast, the place where I bring on successful bootstrapped business owners and dig deep into the strategies they use to grow their businesses. 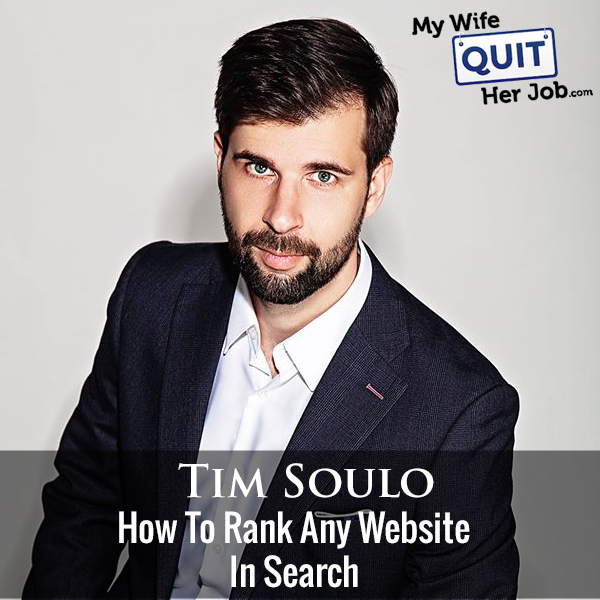 Now today, I have Tim Soulo on the show, and Tim is the CMO at Ahrefs, which is the best all in one SEO research tool out there that I actually use multiple times per week. And today we are going to discuss how to rank websites in Google search. But before we begin, I want to give a quick shout out to Privy who is a sponsor of the show. Privy is the tool that I use to build my email list for both my blog and my online store. Right now I’m using Privy to display a cool wheel of fortune pop up. Basically a user gives their email for a chance to win valuable prices in our store. And customers love the gamification aspect of this. And when I implemented this form email signups increased by 131%. You can also use Privy to reduce cart abandonment with cart saver pops and abandoned cart email sequence as well at one super low price that is much cheaper than using a full blown email marketing solution. So, bottom line, Privy allows me to turn visitors into email subscribers and recover lost sales. So, head on over to Privy.com/Steve and try it for free. And if you decide you need some of the more advanced features, use coupon code MWQHJ for 15% off. Once again, that’s P-R-I-V-Y.com/Steve. I also want to give a quick shout out to Klaviyo who is also a sponsor of the show. Klaviyo is the tool that I use to build real quality customer relationships with my e-commerce store. Now, because all my transactions and email correspondence is tracked in Klaviyo, I can easily build meaningful customer relationships by listening, understanding and taking cues from my customers and deliver personalized marketing messages. So for example, with one click of a button, I can easily send a specific and targeted email to all customers with a lifetime value of over $100 who purchased red handkerchiefs in the past year. Now, it is for this reason why over 10,000 brands have switched over to Klaviyo. And you can try them for free at Mywifequitherjob.com/K-L-A-V-I-Y-O. Once again that’s Mywifequitherjob.com/K-L-A-V-I-Y-O, now on to the show. Steve: Welcome to the My Wife Quit Her Job Podcast. Today I’m excited to have Tim Soulo on the show. Now Tim is the chief marketing officer and product advisor at Ahrefs an industry leading SEO tool powered by big data. Now he’s got 10 years of practical experience in SEO and digital marketing. And what I like about Tim is that he loves to share his knowledge of SEO. And in fact, you’ve probably heard him speak at industry conferences all over the world. And on a personal note, I’ve been using Ahrefs for a while now. And it has been invaluable for helping me perform an SEO site audit for both my blog and my online store. And today, I actually don’t even write a blog post at all until I’ve run the tool. So I’m super excited to have him on the podcast. And with that, welcome to show Tim. How you doing today, man? Tim: Hey, Steve, I’m doing fine. Thanks a lot for inviting me to the show. And thanks a lot for that awesome shout out to Ahrefs, I’m super glad to hear that you’re actively using it. Steve: You know, I’m so glad to actually get this interview in the books because I know it’s kind of difficult to schedule an interview with someone in Singapore. So I’m really happy it worked out. Tim: Yeah, thanks. Thanks for being flexible with your time really. Steve: So some people in my audience probably don’t know who you are. So if you wouldn’t mind just giving a very brief intro about how you got started with SEO and the history of how you kind of became involved in Ahrefs, that’d be awesome. Tim: Yeah, so I started in SEO, I think 10 years ago now. So yeah, I basically landed a junior SEO job at my hometown back in Ukraine. And from there, I was simply learning everything I can. I was trying out my own websites to rank them to make money from them and then gradually progressed. And I would say just by accident, because I was kind of working on my own projects and kind of trying to promote myself as a marketer trying to promote my own projects. Ahrefs CEO kind of noticed me; he noticed what I was doing online. And he — at first he hired me to do some kind of freelance work for Ahrefs, but eventually it ended up that I came to Singapore and he made me marketing director, it was three years ago. And I was actually marketing director with no marketing department, because when I joined Ahrefs, there were only 15 or 16 people and I was the only marketing person. Yeah – so I was marketing director with no one reporting me. Yeah, and today, we’re at 45 people in our team. And so I think our marketing team was like 10 people or something, depending how you count, because I kind of feel there’s some kind of convergence between our support and customer success department and the marketing department, because the roles are quite similar to those. So yeah, but yeah, our marketing department, I’d say is like 10 people. Steve: Cool. Well Tim, hey, let’s talk about SEO. So can we talk about first, what is working and what is not working in terms of ranking in search today? Tim: That’s an amazing question. Steve: it’s a loaded question but yeah. Tim: Yeah. And like for anyone who’s listening and who is getting ready for me to start plugging a lot of technical SEO jargon or some concepts that people won’t understand, it’s not what I do. Actually, I’m not like a super technical SEO, I don’t like to get really deep into it, I prefer the basic concepts. And I think that on the surface level, SEO is like super simple. All you need to do is you need to figure out if people are searching for whatever you have there. So if you want to write an article, you need to figure out if people are searching for the topic of that article, and then you need to build links to it. So these are the only two things that you need to nail and you’ll be good. All the other like Hreflang, and like multi lingual SEO and schema.org and blah, blah, blah, blah, blah, it is it is complicated and it only helps a little. But you need to nail those two foundations. Steve: Okay. Actually, let me start by asking you a question specifically. So recently I performed an SEO audit where actually eliminated, I would say maybe 35, 40% of the posts that just were not very good. Have you found that SEO site audits where you’re eliminating bad content has improved search rankings for your clients? Tim: To be honest, I cannot tell you exactly if it does help or not, because we’re not an agency. Tim: So we work on our own blog. We don’t work on blogs of other people at scale. So we didn’t have an opportunity to test for example, you have two similar blogs. And one of them, you will delete a lot of content that doesn’t bring search traffic and redirect those articles to some other relevant ones, and on the other blog you will leave things as these and see which blog will perform better. So we didn’t do this kind of experiment. But on our own blog, we are continuously and constantly deleting any underperforming articles. Steve: But just let’s say the content wasn’t outdated, it just wasn’t performing that well, you would still recommend removing it, or redirecting it? Tim: If the content is good, and the article is not doing well, what I would recommend is first to check if there’s a surge demand for this kind of topic, this is something that I just said. You need to make sure that people are searching for whatever you’re writing about in your article, and that your article is kind of tailored towards this search, so that you’re matching the search intent. And the second thing, if article is not performing, it needs more links because links is what is the kind of primary ranking factor in Google, it is what gets you to the top of Google. And then like I said, what we’re doing at Ahrefs, if we publish a great article, and then it doesn’t end up ranking well in Google, the first thing that we’ll check is if we’re matching the search intent, if our article is what people searching for something specific want to see. And then we would probably rewrite it with some new information, we would make our headline for example, more better and have some more interesting promise within the article, add some information, remove some information, maybe actually make the article shorter, if we decide that people are probably reluctant to read a lengthy piece. So we will try to figure out how to kind of please our potential readers, and then we will relaunch the article as if it is entirely new, you will send it to your email list, we will promote it with Facebook ads, we’ll send some outreach emails in the hopes that people might link to us. And usually after an update, after a kind of clever update, quite a few articles start performing well. But sometimes it takes us I don’t know, three to four updates to finally figure out what the article should look like and to finally accumulate enough links to that article for it to be able to rank. So yeah, we don’t look at our content as one off pieces, we’ll continuously go back, review how the articles are forming and if we should invest time into updating and re-promoting them. Steve: So what is your process? So you mentioned a bunch of things there, right. So search intent, what is your process for determining whether your article matches the search intent? Tim: It’s just like common sense. So it’s hard to explain because there’s no like process in like instead like do you do this first, do the second, I’ll just tell you what recently happened with one of our articles. And I think if people will be able to understand how we do it here at Ahrefs. So we published an article on the topic of what is SEO, because a lot of people are searching for things like what is SEO and blah, blah, blah, then you want to direct them to the article. So we thought it would be kind of smart to reach out to the most prominent people in our field, ask them this question, what is SEO? And we kind of knew that everyone would give different answers, because there is no specific definition for SEO, everyone understands it as they want. So we got a lot of interesting answers. We kind of created our article. Now on top of these answers, we created what people were telling us, the structure we did nicely and created an article what is SEO based on what prominent people in our field told us. We promoted it, some of these people tweeted it because they had their quotes there. But the article didn’t end up ranking in Google. So when we posted this article on our kind of internal Slack channel and started discussing, why didn’t the article perform that well? It was actually our CEO, who said, are you sure that people are searching for what is SEO in Google? They’re looking to get quite advanced answers from the top people in the SEO field, maybe they’re just looking for super basic explanation what is SEO like on the most, most surface level, instead of going into deep details and complex thinking process that those experts had offered us? And so right now you’re thinking, yeah, probably when people are searching for what is SEO are getting high quality, complicated answers from top people in the field is probably not what they want. So yeah, this is how we kind of make sure we nail the search intent. We just try to put ourselves in the shoes of searchers, and figure out what could they — like what do they need when they search for something? What do they mean when they search for x? So this is our process. Steve: So let me ask you this, though, you keep using the word underperforming. So what are the metrics that make it under performing in the first place? Like do you look at your analytics data? Do you look at bounce rate, time on site? What do you look at? Tim: Yeah, this is a great question. And for me underperforming is I simply search for something in Google, I take the top ranking articles, I put them into Ahrefs, and I look at how much traffic these articles get in total. So, whenever we publish an article, and we see that this article, first of all, it doesn’t rank on the first page of Google for the terms that we wanted it to rank for, and second, if that article is not getting as much traffic in total as those top 10 ranking articles for the topic, we consider it underperforming. We don’t — yeah sometimes when like with that article about what is SEO, we might go to Google Analytics and look at the time on page, are people actually reading this article? And if time on pages low, it means that we are failing to make people interested in that article. And so we need to rewrite it. Maybe we need to put better information, or if the information is already good, maybe the actual writing style is not kind of up their alley. So yeah, probably time on page is the best indicator that readers are not interested in the article. And in terms of performance, like your goals, what kind of goals you have with the content marketing, we look at how well the article ranks in Google and how much search traffic it gets in total, because article doesn’t rank for a single keyword, it will rank for a lot of search queries. Steve: Actually, you know what? So when you’re talking about time on site, what is your baseline for comparison? Do you look at like your average time on site for an article or what are your metrics? Tim: There’s no baseline actually. And usually, the time on site would be either like super small, like less than a minute. No one can read a lengthy article in less than a minute. Or it can be like three minutes plus, and it means that it’s okay, because it’s average. So some people will read the article till the end. But some people will read only a little bit and bounce and this way skew the average number to a lower one. But usually, the time on page should be relative to the length of your article. So I think the average reading time is 200 words per minute I think, I don’t remember, I need to Google it. So just calculate what is the average time to read your article and then look at your average time on page for that article and you’ll see if people manage to read it till the end within the time frame. Steve: Okay, you know, this question actually Tim just came into my mind right now, should I be indexing my podcast episodes? Now there’s a transcript, but most of my podcast episodes never end up ranking, because there’s no structure to the content. So do you recommend people index their podcast pages on their blog? Tim: This is a good question, so yes and no. So on one hand, for example, with these podcasts; I don’t really see what kind of search it would fall into. Do people search for interviews of Tim Soulo? I’m afraid I’m not [overlapping 00:17:12] means or whatever, for people to be searching for interviews with me. So probably you won’t get any search traffic out of it. You could try the ranking for I don’t know effective blogging strategies. If that’s not too competitive, you could kind of call your podcast effective blogging strategies, have all the transcripts there, and probably, you would be able to get some traffic towards it. But if your podcast names are generic, and if during the podcast you discuss a lot of different topics with each of your guests, it would be really hard to rank for anything, since you’re covering so much stuff in one podcast episode, so the page will be relevant to too many things at once. So yeah, he you should either go for more focused episodes that talk only about a single topic, or I don’t know, no index your episode so that Google won’t see a lot of pages that don’t have any traffic from search and don’t really don’t have specific topics. Steve: Great answer. So, Tim, you also talked a lot about backlinks right in terms of ranking. So what is your blog’s strategy for building backlinks? Tim: I’m not sure that our own strategy would be relevant to people because we have a large enough audience and we have a good enough budget. So our strategy is simply send email to all our email subscribers, post our article a few times on Twitter, Facebook and everywhere where our friends and our customers are following us, and also put like $300 plus into Facebook ads. Some of it goes through retargeting past blog visitors, some of it goes to reaching new audiences. And simply by doing these things, we reach enough people to have a high chance that some of these people because we are also in internet marketing niche, which means that almost everyone in our niche has a website, some people have like three to five websites, some people have 10 websites. So basically our audience is audience of people who have websites, and simply by reaching this audience with our articles, we have a high chance that we’re going to get backlinks. So we are frequently mentioned in different roundups, people post our articles on different forum discussions, etc. etc. So we don’t need to be kind of proactive in terms of building backlinks. And we also have kind of a trusted brand right now. So it also helps. So our strategy would only be relevant to companies who are kind of at our stage, who have their audience, who have their brand, and who have some budget in terms of paid promotion of their content. But for people who are just starting out, there is no better way to promote your content to get backlinks other than reach out to people in your niche who have websites. So like I said, for the most part, you can only get a link from a person who has a website. If a person doesn’t have a website, it is unlikely that you will get a link from them unless they will post it on some public forum or whatever. So a good strategy is to simply make a list of all websites in your niche. So for example, if you’re a travel blogger, you should have a list of all other travel bloggers, you should have a list of all other travel websites, you should have a list of websites or e-commerce stores that sell some travel stuff, etc. etc. You should know your kind of online niche. And whenever you publish an article, you should out of all these websites that you know, you should create a list of people who might be interested in reading that article, and who might be interested in linking to that article from their websites, and just reach out to them and show them your article. And if your article is any good, if it is relevant to these people, there’s a high chance that they will link to it, maybe not immediately, maybe simply going forward in a month, in two months but you might lend the link. Steve: I was kind of curious how you’re going to answer that because I was going to give my answer to that question. Steve: So for me, I feel like SEO, at least the back linking part is all about social engineering at this point. So you really have to go out and try to meet people, other webmasters become friends with them and basically you help each other occasionally when there’s a post that you want to rank. And like you said, you can’t — it’s really hard to just cold email someone and get them to link to your site. But if you already have a relationship with them, the likelihood of it happening is much greater. Tim: Yeah, exactly. Actually, I look at marketing overall, as an interaction between people. Some people like to think of marketing, as I don’t know, in terms of campaigns or in terms of growth hacks, but what I see it’s all about relationships. When you want someone to read your article, it’s not mechanical, it’s not that you use some mechanical or I don’t know, psychological trick to kind of persuade that person to tweet your article, it doesn’t work this way. You should you should have an amazing article, then you should have some kind of connection to the person, for them to even care about reading your email or listening to you. And when you’re marketing to your audience, you’re marketing to individual people as well. So it’s not that you could use some tricks or some mechanics to somehow bring tra — a lot of people think of traffic to their website as just numbers. I think of traffic to my websites as individual people, as real people. So yeah, it’s all about interactions. It’s all about building your relationships. It’s all about building community, building your brand. So I totally agree with you. Steve: Yeah. So Tim, let’s switch gears a little bit. And let’s talk about everything that you do before you put down a blog post, like how you do keyword research, how you determine whether it’s going to be easy to rank for or not, what is your process? Tim: It is super easy. So I’m using our own tool, I’m using Content Explorer, because I don’t think I saw this feature in any other keyword tools. So basically, what they do, whenever I have an idea of any article, I will just formulate a search query without even thinking of it. So for example, for what is SEO article, I could write into keywords Explorer, like how does SEO work? Or what does a show mean? Or what does SEO mean today? Or how do you study SEO in 2018? So I can come up with any search query at all, without thinking if other people around the world will search the same way as me. And the reason I do this is because our tool keywords Explorer, what it will do, it will pull the top 10 ranking pages for any search query that I put into it, just like Google. So you basically can do this with Google, not with keywords Explorer. But the only difference is that keyword explorer will then show you the total search traffic to each of the top 10 ranking pages. So we don’t need to know the exact keyword like the most popular way of how people search for something, I only need to search it in my own words, and Google will still rank the most relevant page and Google will rank the same page for all the search variations that other people would use. So wait, I’m only interested in the total search traffic potential of the topic. And that’s basically, a lot of people; they look at the search volume of individual keyword, which obviously correlates with the total search traffic that you’re going to get from all different search query variations that other people will use. But sometimes, there are cases where the individual search volume of individual keyword would kind of discourage you from making an article on the topic. But in total, the top ranking page would get a lot of traffic from all the keyword variations. So yeah, I don’t just look at the individual — on the search volume of an individual keyword, I always explore the top ranking pages and how much traffic they get in total. And this is what kind of drives my decision if I want to pursue this topic or not. And in terms of figuring out the difficulty, so first of all, I try to simply ask myself for a question like, will I be able to create a better page on whatever topic I’m targeting than those pages that already rank there? What would be the value for searchers, for people? How am I going to stand out? Why would Google consider ranking me above those pages that are already there? So if what I’m going to do is take those top 10 pages, rewrite them in my own words and put my own article, that’s not going to work, I need something original, I need something new. I need something that will stick with people more than the top ranking pages. And if I know that I’m able to come up with a better piece of content than those top 10 ranking pages, the last thing that I would look at is the number of backlinks that they have, and specifically the number of unique websites that are linking to each of the top 10 ranking pages. If I see that most of the top 10 ranking pages have, I don’t know 50 plus backlinks, backlinks from 50 plus pages, it means that the topic is quite competitive, especially if they have like 100 plus backlinks to each of the top ranking pages. But if I see that most of the top ranking — top 10 ranking pages don’t have many backlinks, it means that it would be easier for me because I’m kind of estimating my own chances to get as many backlinks with my own article. And I know that getting like 10 backlinks for us at Ahrefs is like super easy. We don’t need to bother about it at all. But if we need to get like 200 backlinks from 200 websites, I know this is quite challenging. So we won’t be able to rank within those search results that easily. Steve: Doesn’t the quality of the backlink matter? I mean they could have 200 backlinks from crappy sites, right? Tim: Yeah, that is true and quality does matter. But for our own process, we don’t really spend that much time researching. So we don’t really dig into the quality of backlinks of the top 10 records. So if you’re analyzing top 10 ranking pages for the keyword that you want to rank for, and each of the top 10 ranking pages has 200 backlinks from 200 and plus websites. So this means 200 times 10, it would be 2,000 backlinks that you need to review to even make a decision if you want to write article about this. So in our case, it is quite different. We simply decide if the topic is important enough for us to go and wrestle with those big guys. And if it is important to us, we will still write an article even if we see that the top ranking pages are super competitive. But then we’ll use their backlinks, we’ll use their like 2,000 backlinks of that top 10 ranking pages have in total to piggyback from them. So we’re going to see who is linking to them, we’re going to reach out to all these websites, we’re going to show them our content, hoping that those same websites will link to us as well, because they linked to these pages. Steve: What’s your hit rate when you try to do that? I imagine you’re reaching out to strangers, right for this. Tim: Yeah, we’re reaching out to strangers for sure. But again, here at Ahrefs, we have kind of a rule, we don’t explicitly ask for a link. So we don’t reach out and say, hey, I saw that you’re linking to this article from your article about this, can you please put a link to us as well? We never do that. We consider it kind of sketchy or we consider it stupid I would say. We simply try to impress people with our articles. So what we will do instead, we will reach out and say, hey, I found your website, I see that you’re interested in this topic. Now I recently wrote an article about this and the cool thing about this article, or the interesting fact from this article is that, this and this and this. So if you’re interested to learn more, if that was interesting enough to hook you, you can read the entire article here at this link. And so we simply track if people are opening our emails, if people are replying to our emails. So if a person will actually reply to our email and say, yeah, that was like an interesting fact, I never thought that I could consider this topic from this angle, and blah, blah, blah, we then might reply to that person and say, oh, it’s awesome that you enjoyed our content. Well, if you ever find a chance, if you ever have a chance to link to that article, we’ll be super grateful but that’s it. I just wanted to take a moment to tell you about a free resource that I offer on my website that you may not be aware of. If you are interested in starting your own online store, I put together a comprehensive six day mini course on how to get started in e-commerce that you should all check out. It contains both video and text based tutorials that go over the entire process of finding products to sell all the way to getting your first sales online. Now this course is free and can be obtained at Mywifequitherjob.com/free. Just sign up right there on the front page via email and I’ll send you the course right away. Once again, that’s Mywifequitherjob.com/free. Now back to the show. Steve: What is your hit rate? Because I know I get emails like that almost every day and it never works on me, like never even if the article is awesome. So what is your hit rate? Tim: The hit rate is pretty low. I think out of a hundred emails, we might get five backlinks within the week. Steve: That’s too bad actually, that’s higher than I was expecting. Tim: Yeah, but that’s because we have a brand and a lot of people in our industry know us. And that’s because we often try to create amazing content that is better than anything what’s already there. So if people are trying to reach out to others with kind of average articles, and without having any brand at all, I guess it will be harder for them. But still, if I were starting out again, I would still do this because by doing this, you’re putting yourself on the radar of a lot of people. And even if you reach out with the first article and no one replies, you then write a second amazing article and then you reach out to more people. And then you write the third amazing article and then you reach out to more people. And some people start noticing and sure, that you just said that it doesn’t work on you. But I’m absolutely sure that you’re noticing that there are certain people who produce amazing content; you see a lot of people that reach out to you with stupid content with simple articles that you’re not interested in. But sometimes you see that someone is really promising. For example, back in the days when I just started working on Ahrefs blog this way, I actually found a few kind of guest writers for our blog, because people reached out to me with articles that I enjoyed. So by reaching out to people in your industry, and by making sure that you are only reaching out to them with your best content, you’re putting yourself on their radar. And even if they won’t link to you immediately, they might still kind of make a mental note that there’s this guy who creates amazing content on this topic and they might reference you in future. So it might help you in the long run. Steve: That’s a really good point, actually because there have been some people even though I didn’t link to them, I now know who they are and I’m probably more receptive to them going forward. All right, let’s switch gears once again; let’s talk about e-commerce sites. I know you don’t have a lot of experience ranking e-commerce sites. But as you’re probably aware, most e-commerce sites, they’re bear on content, right? You got a product description; you have a category page sometimes with little or no text. How do you rank those pages? Tim: Yeah, it’s like you rightly said, I’m not an expert in e-commerce. I don’t think I ever had an e-commerce website. But because a lot of our customers, a lot of people for using Ahrefs, they have e-commerce websites, I had quite a few kind of meaningful conversations. So I think I know that if I were to start an e-commerce website today, what I will do. So first of all, if your product, if you want to rank your product pages and they don’t have a lot of content, then it is kind of obvious that you need to try to put content on those product pages. And they like — the only reason why people don’t make — reach an awesome product pages is I think they’re probably they’re just lazy. Because whatever product you take, you can invest in making for example, awesome photos of this product. And I’ve seen a company that sells car parts, and everyone in their niche, they were using the standard photos that the manufacturer of the car parts was giving them. But this company, they approached it differently, they set up a small studio, and they were reaching out to all the car part manufacturers and asking them to send them samples. And they were making their own photos. And their product pages were all already looking better and people stayed longer on their product pages, simply because they could click more images of the car part from different angles. And that improved time on page and this is something that Google likes. In terms of product descriptions, that same company, they hired quite a few different automotive bloggers, people who are interested in cars, and all that stuff. And they asked them to basically post good descriptions, good reviews of those different car parts. And eventually they had rich product pages that could generate a lot of traffic. So if people are saying that they have product pages, and there’s lack of content, then I’m sorry, I don’t have any advice for you, it will be hard to rank with those product pages. And whatever tricks you use to rank those product pages, whenever someone will create a store and create rich product pages, with awesome photos, with awesome description and with even customer reviews, you will get outranked by those product pages. And then so in terms of building links to your e-commerce store, it is also quite challenging, because people generally don’t tend to link to products directly. But for example, what I’ve seen when I was shopping for wakeboards, I saw that one of the e-commerce shops for online e-commerce shops for wakeboards, they created a sizing guide. So you should buy a different wakeboard based on your head, based on your weight. You also have to determine your shoe size and all that stuff. And so they created a nice guide, where you could pick the right size of wakeboard for you depending on your height, and how much you weighed. And this kind of resource generated at tone of backlinks. And they simply funneled that link juice that they got to this resource to different product categories. And from these categories, the link juice flowed further to the actual products. So if you struggle to build backlinks to the product pages or category pages, which I’m sure is the case for any e-commerce store, you should think of creating kind of valuable resources for shoppers, for people who are interested in buying whatever you have, and then building backlinks to those valuable resources and then funneling the link juice that you get to those pages towards your category pages and towards your product pages. And this will help them rank better. Steve: Do the social factors matter in ranking based on your data? You guys have a whole bunch of data right on all these backlinks and everything. Do social shares make a difference? Tim: Yeah, we have a little data. But whenever we do a study, we always say that correlation is not causation. So we can kind of study, like if top ranking pages tend to get a lot of social shares. But we can’t really say that it is social shares that help them rank because once you rank at the top of Google, you consistently get search traffic. And as you consistently get search traffic, it means that some of these people will treat you right. So it’s kind of a vicious circle. Do you get a lot of social shares, because you rank well, or do you rank well because you get a lot of social shares? So overall, I don’t really think that social shares in terms of numbers do matter. So if you just go on Fiverr, or whatever website sells tweets, and shares, and whatever, and buy those “signals,” I’m pretty sure that won’t help you. But if your article kind of naturally generates buzz, if people visiting your article to read it to their followers, and some of their followers see the tweet and click a link and go back to the article, and then some of them tweet it again, Google, I’m pretty sure that Google can kind of see this dynamic. They might not see even directly as a kind of tweets, or Facebook shares, or whatever, but I’m pretty sure that Google can see that your article is taking off, and that your article is generating word of mouth, and then it does help your article to rank especially it helps it to rank immediately. So I mean, we had quite a few cases where we would publish an article at Ahrefs blog and the piece was a little bit controversial. So it starts to generate a lot of buzz on Twitter, on Facebook, etc. etc. and we had a huge traffic spike. And what we saw is that the article ranked in the top 10 for its keyword within less than 24 hours. So less than 24 hours, and Google was able to see that our article is generating a lot of buzz on social media that it was getting a lot of traffic, and Google would put our article at the top of the search results. Later, when the buzz faded and the traffic to our article faded, Google will also put it lower and use probably some different signals to figure out if they should put us back in the top 10 search results. But I’ve noticed it quite a few times that whenever your article takes off, whenever it initially performs and generates more buzz than your average articles, Google somehow will be able to see this and it will also support it by ranking it at the top of the search results immediately. But from my experience, that affect it never stays for long. So eventually, Google will drop your article from top 10 search results unless you will be able to consistently generate buzz and unless your article will get more backlinks so that it will have a stable position within Google search results. Steve: Is that why you pay for Facebook ads for every article that you post? Tim: Yeah, yeah. First of all, we pay for Facebook ads, because that’s like, it’s crazy but it’s one of the ways to bring our own audience back to our content. So we have our email list, but as I’m sure you know and many people know, whenever you send an email to your email list, the open rate is pathetic. It’s like 30%, 20%, I don’t know, maybe the best email list, they get 50% open rate, but you cannot reach 100% of your audience. Same on Twitter, you might have like 10,000 followers, but whenever you tweet something, you get like 15 clicks. So you’re not reaching like all 10,000 of your followers. And same with Facebook, whenever you publish something on your Facebook page, only a few friends will see this. So our primary goal with paying for Facebook ads is to simply reach our own audience because it has no way to do this. And secondary benefit is yeah, we try to generate traffic and buzz to our article to kind of show Google that it is something important and that is something that people like. But then what we don’t have control over is time on page. And I’m pretty sure that Google is also looking at time on page. So we can throw like I don’t know $3,000 into bringing Facebook traffic to our article. But if Google will see that people don’t stick, that people open the article, they scroll a little bit, they see that it’s not interesting, and they will bounce, Google will not rank it. But if Google will see that people come to the article, they stay for long, they read, and then people will also tweet it and bring their friends and article is taking off, it will quickly get to the top of search results and stay there for a while. At least that’s from my experience and from the articles that we publish at Ahrefs blog. Steve: Just curious, how long do you run that ad for when a new post comes out? Or is it kind of indefinite? Tim: Yeah, great question and we actually have some kind of system there. So initially when we release the article, we have a fixed budget of anywhere from 200 to $300 into promoting that article, and it goes equally, like half a week goes to retargeting our previous blog visitors and half of it goes towards trying to reach brand new audience who have never visited Ahrefs blog before. And from there, once we’re out of the budget, once we out of $200 or $300, we compare the performance of that newly published article to the past articles that we promoted the same way. And if we see that the cost per click — for us, the threshold is less than 30 cents. So if we get clicks for less than 30 cents, we would throw even more budget into that article and we’ll probably try to optimize audiences to get even cheaper clicks, we’ll try to create additional ad copy, maybe even additional image to see if we can get even cheaper clicks. And then if we see that the article consistently performs well, and it gets us consistently cheap clicks, we’ll move into the category that we call evergreen articles. These are the articles that we kind of promote indefinitely. And we will throw more and more budget for them from month to month to month because we see that these articles are bringing us cheap traffic. Steve: And in terms of — do you do analyze how well the traffic does in terms of converting into email subscribers or whatnot? Tim: That’s interesting, because we don’t do this. But the only reasons why we don’t do this is because I don’t think there’s even a single article at Ahrefs blog that doesn’t mention the awesome use cases that we can and that doesn’t teach people to use Ahrefs. So whatever topic we’re covering, within the article, we try to show people how to solve that issue with the help of Ahrefs tools and how Ahrefs tools actually make solving that issue easier and more convenient. So, I don’t need to kind of track the conversion rate of these articles. I just know that these articles convert well, based on the fact that we’ve been blogging for the past three years, and we were growing our blog for the past three years. And our annual recurring revenue is also growing quite well. And I see a lot of tweets that literally say that Ahrefs team is like super good at plugging their own product within their content and explaining their readers how their product is awesome. So we don’t even need to track the conversion rate because if I know that the conversion rate is 7%, or 15% of 5%, it doesn’t matter to me at all, I just know that people do convert, so it makes sense for me to promote that content and get more customers. Steve: Okay. My final question here on my list is do you guys even bother using the disavow tool anymore or removing any bad links from your site? Is that a thing anymore? Tim: This is an amazing question. And honestly, I don’t know the answer. Again, I can speak for ourselves. Recently, I saw that we had a negative SEO attack. So someone was trying to build thousands and thousands of low quality links to one of our pages. And actually I posted this on our internal Slack channel and asked for opinions of other guys. And I actually even emailed a few of my friends asking them what should we do, should we care about disavowing them or not? There were different opinions. Some people said, yeah, you should disavow all these backlinks. Other people said that you have a strong enough brand, and you have a good enough back link profile. So Google should be able to figure out that this is some kind of negative SEO happening, and it shouldn’t affect you. So what we ended up doing is we did nothing. And so far, nothing happened. We didn’t get any penalties. And the page is actually — that page that was kind of negative SEO filled with bad links is actually now ranking number one for its term. So probably the person who was trying to negative SEO us, they actually helped us. But I don’t know, maybe within one month, Google algorithm will figure out what’s happening and ban us, and then we’ll have to disavow but so far, we didn’t disavow. So for us, right now, based on this specific case that happened just I don’t know, three months ago or something, I feel that we have a strong enough website that we don’t care about disavowing bad links. But as I speak to a lot of agency owners, they do actively disavow to prevent whenever bad links are being pointed at the websites of their clients. And obviously, you should disavow after you get the low quality backlinks penalty or artificial backlinks penalty. Tim: That is like 100% obvious if Google told you, hey, you have those artificial links, you should do something about it, then yes, obviously, you need to try to remove them in the first place. And then those that you can’t remove, you have to disavow. But should you disavow preventively? For us, it doesn’t make sense. For other people, there are mixed opinions about this. Steve: Okay, so final question, Tim. And this kind of goes out to everyone who has a brand new blog with no authority whatsoever, what would be your best piece of advice to people just starting out? Tim: To people just starting out, my best piece of advice would be to do something extraordinary. This is the best to way to kick start your blog and this is the best way to get traction. What I see — the most common mistake that a lot of bloggers make whenever they start a blog, they simply start writing about the same things that all other bloggers in their industry are writing. So they would go read 10 blogs, they would learn something and they would go and post an article about the same thing that they just learned from other blogs. There is no value in that I’m afraid. So if you’re starting a new blog, you should figure out something unique that you can do. Like, it might be even as simple as after reading advice from those 10 blogs, don’t just give the same advice in your article, do this. So if you’re if you’re following weight loss blogs, and all of them tell you that there is a recipe of like healthy breakfast and blah, blah, blah, blah, blah, blah, then start eating this breakfast for 30 days. Track everything, track your weight, track your health, track your mental performance, I don’t know, and write the article with your results. So don’t just write an article that here’s an awesome recipe of healthy breakfast that I read elsewhere. No, just do it, try it and write your own results. And then you can say that okay, so initially in this recipe there was celery, but I think that celery didn’t taste good. So I replaced it with this. And it felt better. So by doing this, by actually doing something before blogging, you’re creating unique content that is amazing that people want to read. People don’t want to read reversed articles. They don’t want to read the same advice they’ve read elsewhere, they want something unique. So if you’re starting a new blog, you should first and foremost think about things, about unique things that you can do. Steve: So just to kind of sum it up, just great content that’s kind of personally tailored and putting your own spin on something. Tim: Yeah, but again, putting your own spin. Like I said, you can just read 10 articles and create your articles with your thoughts. So based on reading these articles, you think that something will work or not work. From my experience, what you think, no one cares. Everyone cares about for results, what you do. So actually do something, get the firsthand experience, not your thoughts, but your actions, and then blog about it. So this is what works. Steve: That’s great advice, Tim. Thanks a lot for coming on the show. I just want to give you guys a chance to plug Ahrefs. What do you guys do, what’s the tool good for? Tim: Well, first of all, I would like to plug that Ahrefs is not just a set of SEO tools. These days, we have a blog where we have a lot of awesome materials about SEO, about marketing, about content marketing. So people should definitely visit Ahrefs blog. Steve: And a YouTube channel too, the YouTube channel is excellent. Tim: Yeah, we also have a YouTube channel where we share tutorials, and where we teach people awesome marketing and the sales strategies. And then we also have a Facebook group where our customers are helping each other, answering each other’s questions. And our team also tries to always be helpful and jump in and help people. And as for Ahrefs, Ahrefs is a set of SEO tools. But Ahrefs is not some magic button that you press and it will do SEO for you. You need to understand what you’re doing because we only give you information and then you need to act on this information. This is why I’m saying that you should read Ahrefs blog and watch Ahrefs videos because you need to understand how marketing works and how you can apply different strategies to your own business. And then you’ll probably go to Ahrefs and use some of our tools. Steve: Sounds good, Tim. Thanks a lot for coming on the show. Really appreciate your time. Steve: No, absolutely. Take care. Steve: Hope you enjoyed that episode. SEO is a huge part of both of my businesses, and Google actually brings me tons of free customers every single year. For more information about this episode, go to Mywifequitherjob/episode251. And once again, I want to thank Klaviyo for sponsoring this episode. Klaviyo is my email marketing platform of choice for e-commerce merchants. And you can easily put together automated flows like an abandoned cart sequence, a post purchase flow, a win back campaign, basically all these sequences that will make you money on autopilot. So head on over to Mywifequitherjob.com/K-L-A-V-I-Y-O, once again, that’s Mywifequitherjob.com/K-L-A-V-I-Y-O. I also want to thank Privy for sponsoring this episode as well. Privy is the email capture provider that I personally use to turn visitors into email subscribers. They offer email capture, exit intent, and site targeting tools to make it super simple as well. And I like Privy because it’s so powerful and you can basically trigger custom pop-ups for any primer that is closely tied to your e-commerce store. Now, if you want to give it a try, it is free. So, head on over to Privy.com/Steve, once again, that’s P-R-I-V-Y.com/Steve.